Are you so tired of searching for a solution to recover your photos and videos taken with your loved ones during an outing or during a ceremony? Is it your favourite song which you are not able to play today? Are you so confused about a new folder named as Found.000 where all your photos or videos are converted into .chk files? If your answer is yes for any of these questions, you are now in the right place where you will be recovered from your problem with the help of free recovery software commonly called as a freeware. Before actually getting into action for solving the issue, it will fine if you know about the root cause of the problem which created head ache for you, so that the same is not repeated any more and even if repeated may not bother you so much. What is a .chk file and why it replaced your favourite photos and videos? CHK refers to checkpoint file. It means Windows has crashed and it has created a restore point in the so called .chk format giving the user an option restore it later. This problem might usually happen with pen drive or memory card where the user might have unplugged the memory device from the computer without safely removing it. Whether the file is a photo or video or audio it will be replaced with .chk suffix in general. Usually the corrupted files are changed into .chk format when you do disk check in your Windows computer. The first and foremost reason why I rate the software as the best is that it is a freeware and it does a perfect job what most paid software's do. You don't have to pay even a single rupee to download the software and it's totally free just like the expert advice provided in Techulator. All you have to do is, just download the freeware from their homepage which is hardly about 200kb and install it in your PC. It's not such complicated software and it has just 4 options (browse, start, cancel and more) to click and even a beginner can operate it so easily. Once the software is installed, click on browse button in the software and choose the folder or file which has the .chk file to be recovered back into your beautiful photo and video. Click on start and the software will automatically segregate audio, video and image files. For me it consumed hardly 4 to 5 minutes for restoring 2000 files and now you will understand why I said it best. I recently faced this problem with my pen drive and it had very valuable photos taken during an important ceremony. I tried lot of softwares suggested in many sites and everything finally asked me to pay something and if it is a freeware it failed to do anything. 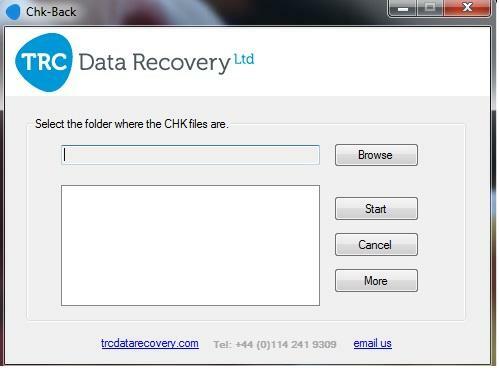 Finally just a Google search took me to Chk-Back, free recovery software from TRC data recovery limited. I scanned it with my updated quick heal 2012 anti-virus and it gave a clean chit. It just consumed a negligible space and being a freeware nothing popped out often telling me to buy a premium version or anything similar so. 98% of the files were restored perfectly. So without hesitation you can go ahead downloading the software. Bookmark this page and once the photo or video is restored give us your feedback with a smiling face as response below. File Processed "File0000.CHK"-File Type Unknown, What else can I do to get back the original content? Excellent freeware. I am not a computer literate but I found it very easy to use. Thank god and the program developer. I have recovered very valuable photographs I had taken in 2006 during a wedding. I cant recover any files. Why?